OK. I’ve gotten a bit more sleep (not enough, mind you, but some), and while the baby is in my care right now, he’s quiet for the time being, so let’s get this done. First off, the topic… I want to look a the relationship between corporate tax rates and unemployment. Links to the data are posted below, but all the information I use, plus the analysis itself, sits in this google spreadsheet. Figure 1 below shows the data used in this post; the top corporate marginal tax rate (obtained from the IRS) is on one axis and the unemployment rate for individuals sixteen years and over (from the Bureau of Labor Statistics) is on the other axis. 1. For the longer samples (1948 – 2009 and 1960 – 2009), the correlation between tax rates and unemployment rates is very close to zero. 2. For the three shorter time samples, the correlations are very big (positive for 1970 – 2009 and 1980 – 2009, negative for 1990 – 2009). That seems to indicate that corporate tax rates did not use to have an effect on unemployment, but in recent years, they may be never used to have an influence on jobs. That influence may not be in the direction that tax cut proponents keep telling us about, though, as evidenced by the 1990 – 2009 series; anyone who has read Presimetrics won’t be at all surprised, as we point out the same thing in a completely different way. I think its because over time, our economy has become more loop-hole oriented than doing things oriented. Something odd seems to be happening in US public opinion. Pollsters are shifting from polls of registered voters to polls of likely voters. Given demographics and the enthusiasm gap, I expected the Republican lead in the House generic ballot to increase. Until recently, that seemed to be happening right on schedule. Since then there have been several polls showing a surprising close race. If I toss Rasmussen polls out (because I don’t like their results but at least I admit it) and set sensitivity to high so new polls count more I get a pollster smoothed average showing a the Democrats ahead ! * This is mostly determined by ten polls in September six of which are polls of likely voters and five of which are polls of registered voters. I’m pretty sure I’m over interpreting data and seeing what I want to see. I guess it’s conceivable that recent Tea Party success in primaries have scared voters. *this is a link to a graph which will be updated. For some reason, when I try to dowload the graph I get the smoothed average including Rasmussen. NBER just made official what we all knew they would say: the Great Recession ended in June of 2009. Update: Updated links and formatting made 3:00 PM. The BLS reported this morning that the Consumer Price Index for Urban Wage Earners and Clerical Workers (CPI-W) was at 213.898 in July. This means it is very likely there will no change to Social Security Benefits and the Maximum Contribution Base again this year. The calculation dates have changed over time (see Cost-of-Living Adjustments), but the current calculation uses the average CPI-W1 for the three months in Q3 (July, August, September) and compares to the average for the highest previous average of Q3 months. Note: this is not the headline CPI-U. •In 2007, the average of CPI-W was 203.596. In 2008, the average was 215.495. That gave an increase of 5.8%. •In 2009, the Q3 average of CPI-W was 211.013. That was a decline of -2.1% from 2008, however, by law, the adjustment is never negative – so the benefits remained the same this year. This graph shows CPI-W over the last ten years. The red lines are the Q3 average of CPI-W for each year. The COLA adjustment is based on the increase from Q3 of one year from the highest previous Q3 average. So a 2.3% increase was announced in 2007 for 2008, and a 5.8% increase was announced in 2008 for 2009. In Q3 2009, CPI-W was lower than in Q3 2008, so there was no change in benefits for 2010. Even though there was no increase last year, and there will probably be no increase this year, those receiving benefits are still ahead because of the huge increase in Q3 2008. For 2011, the calculation is not based on Q3 2010 over Q3 2009, but Q3 2010 over the highest preceding Q3 average … the 215.495 in Q3 2008. This means CPI-W in Q3 2010 has to average above 215.495 or there will be no increase in Social Security benefits in 2011. In July 2010, CPI-W was at 213.898, so CPI-W will have to average above 216.294 in August and September for the Q3 average to be at or above Q3 2008. That suggests an increase in COLA is very unlikely right now. The law – as currently written – prohibits an increase in the contribution and benefit base if COLA is not greater than zero. However if the there is even a small increase in CPI-W, the contribution base will be adjusted using the National Average Wage Index. … … any amount that is directly dependent for its value on the COLA would not increase. For example, the maximum Supplemental Security Income (SSI) payment amounts would not increase if there were no COLA. This is based on a lag. If there had been an increase in COLA last year, the contribution and benefit base would have increased by about 2.3% based on the increase in wages from 2007 to 2008. The National Average Wage Index is not available for 2009 yet, but wages probably declined – but it probably won’t matter for the maximum contribution base since COLA will probably be zero. •In 2011, for benefits, there will probably be no increase (although we need to see CPI-W for August and September to know for sure). •For the contribution base in 2011 there will probably be no change too. However, if the COLA is even slightly positive, the increase will be based on changes in the national average wage index (not COLA). The Bureau of Labor Statistics publishes CPIs for two population groups: (1)the CPI for Urban Wage Earners and Clerical Workers (CPI-W), which covers households of wage earners and clerical workers that comprise approximately 32 percent of the total population and (2) the CPI for All Urban Consumers (CPI-U) … which cover approximately 87 percent of the total population and include in addition to wage earners and clerical worker households, groups such as professional, managerial, and technical workers, the self- employed, short-term workers, the unemployed, and retirees and others not in the labor force. So instead of pursuing budget retrenchment, policymakers need to create incentives for corporations to reinvest their profits in business operations. In their NY Times article, Rob and Yves cite a 2005 JP Morgan study, “Corporates are driving the global saving glut”. In that study, JP Morgan argues that the global saving glut has been driven largely by G6 excess corporate saving, and to a lesser extent emerging economies. In the US, positive corporate excess saving persisted through the latest print, 2010 Q2. The illustration above plots the total corporate financial balance as a percentage of GDP. I calculate the Total Corporate Financial Balance (TCFB) as in the JP Morgan study, which is the residual of the national accounting identity of the Current Account Balance minus the Household Financial Balance minus the Government Financial Balance. According to this measure, the TCFB was roughly +3% in 2010 Q2, or about +1% above the 2008-2010Q2 average (2.1%). Although firms likely worked out much of the debt overhang from the 1990’s, the debt accumulation spanning the second half of the 2000’s was precipitous. It’s very unlikely that the excess corporate saving will fall anytime soon, as non-financial business leverage is high just as household leverage is high. Total non-financial business debt peaked in 2009 Q1 at 79.5% of GDP and is now trending downward, hitting 74.9% in 2010 Q2. If history is any guide, then the “excessive” borrowing spanning 2005-2008 will take some time to repair. Spanning 2002 to 2004, the non-financial business sector dropped leverage 2.5% to 64%. If this 2-year period of de-leveraging indicates an “equilibrium” level of leverage, then non-financial businesses are likely to run consecutive financial surpluses (excess saving) in order to reduce debt levels by another 11 percentage points of GDP for a decade more. If firms run excess saving balances, then they’re not investing in future profitability via capital expenditures nor increasing marginal costs, like wages and hiring, relative to profit growth. So while it is true that some fiscal policy should be targeted directly at investment incentives (Rob Parenteau and Yves Smith article), these measures may prove less effective since the non-financial business sector’s desire to “save” and repair balance sheets is high. I leave you with one final chart to inspire more discussion: a breakdown of the total corporate financial balance into its two parts, financial-business and non-financial business. The financial balances in illustration 2 are computed directly from the Flow of Funds Accounts, Table F.8, rather than taking the residual as calculated in illustration 1. Thus, the total corporate financial balance will not match that in illustration 1. The point is simple: the small drop in excess saving in total corporate financial balance in illustration 1 is stemming from the financial side. The non-financial corporate sector continues to raise excess saving by investing retained earnings into liquid financial assets relative to capital investment. Fiscal policy should be targeted at the high desired saving by the corporate and household sectors alike. The idea is to pull forward the deleveraging process by “helping” households and firms lower debt burden via direct liquidity transfers (lower taxes or subsidies, for example). Only then will healthy private-sector growth resume. In the New York Times Amy Harmon has a long and fascinating article on the ethics of medical experiments on humans. She considers the argument that it is unethical to have a control group which doesn’t get the wonderful new experimental treatment. The immense effort and delay required for approval of clinical trials basically forces anyone who doesn’t have tenure already to devote his or her efforts to treating sick mice and rats. The article discusses two cousins with melanoma one of whom is in the control group and dying. However, if any reader has malignant melanoma with metasteses but no metasteces to the brain or heart and no history of auto-immune diseases, I personally can arrange participation in a clinical trial without a control group. I am absolutely 100% serious. Commenters with melanoma are most extremely welcome and eagerly sought. update: Link added. This post does not discuss the ethics of including control groups in clinical trials. My points are that it is very extremely horribly difficult to get approval for clinical trials, and that this is a moral problem too. Also, if you contact me soon, I might be ablt to get you into a phase 1 trial of treatment of melanoma. Phase 1 means no control group. This is an absolutely serious claim. I did not post contact information for the trial, as I don’t want the team burdened with general debate about ethics. Why Do I Predict That TARP Will Cost Less ? I am generally reluctant to make predictions. However, I am willing to predict that the cost of TARP will be less than forecast by the CBO. I should point out that forecasts of the cost have declined. The reason is that the CBO values TARP assets at “fair market value” which means the value for which they could be sold. It assumes that risky assets are not systematically worth much more to the Treasury than to private investors. Thus the cost is the cost if the Treasury liquidiated its portfolio (without considering the huge market pressure and reputational effects). It is not equal to the expected value of additional debt due to TARP — it is assumed that variance in returns on assets (which by definition doesn’t affect the expected value of those returns) increases the cost to the Treasury. I think this is backwards. It is good for the country for the Treasury to bear risk, so the risky returns act as automatic stabilizers. After the jump, I quote Doug Elmendorf explaining what they do (and indirectly noting that Barney Frank objected). Barney Frank is an excellent congressman. In its August 2010 baseline projections, CBO included an estimated $53 billion in costs for new mortgage guarantees that Fannie Mae and Freddie Mac will make over the 2011–2020 period. That estimate was made using a so-called “fair-value” basis of accounting, which differs from the way most federal credit programs are reflected in the budget. In a letter sent today to Congressman Barney Frank, CBO discusses that estimate and compares it with the budgetary impact that would be estimated using the procedures specified in the Federal Credit Reform Act of 1990 (FCRA), which governs the accounting for most federal direct loans and loan guarantees. CBO estimates that on a FCRA basis, Fannie Mae’s and Freddie Mac’s new mortgage guarantees made over the 2011–2020 period would generate total budgetary savings of $44 billion. FCRA estimates are based on Treasury rates (which are generally viewed as risk-free), whereas fair-value estimates employ discount rates that are adjusted to match the risk of the specific credit obligation. Why is the appropriate adjusment for risk a higher required return not a lower required return ? Elmendorf doesn’t say. He does make it clear that TARP costs are calculated in a way no other costs are calculated (just think what the expected cost of invading Iraq would have been if it were assumed that financial risk must be rewarded). Notice the little correction of $ 97 billion dollars. That is (part of) the difference between the reported expected “cost” of bailing out the GSEs and the expected effect of that bailout on national debt in 2020 (assuming they aren’t reprivatized in which case the national debt will be higher in expected value). I think that answer is that using standard FCRA accounting for Treasury purchases of risky assets would imply that the Treasury should buy risky assets even when there isn’t a crisis and we just can’t have that. That would be socialism. The standard accounting would still be conservative given the desirability of automatic stabilizers (deficits in downturns and surpluses in expansions). If the numbers weren’t calculated with non standard rules, socialism would look sensible, and that just can’t possibly be allowed. Worthwhile Canadian point. Nick Rowe looks at Catherine Rampell’s graph, which everyone has been talking about, and notes the dog that didn’t bark. Very few small businessmen are complaining about the quality of labor. This basically proves that the argument that the incerase in unemployment is due to missmatch is wrong. If the problem were too many construction workers and no workers in other fields, than firms in other sectors would be complaining about trouble finding qualified workers. I add that they might also complain about the cost of labor. These are really the same problem if the minimum wage and contracts negotiated with unions aren’t binding. Firms can always hire quality labor if they offer one million and hour. Fortunately the graph has the fraction describing quality of labor and cost of labor as the number one problem one on top of the other and both shaded blue. The graph shows the fraction of small business men with the blues declining sharply. I am kicking myself for not blogging about this before (I noticed the fact in the graph really I did). I try to make up for lost time after the jump. And get a load of those yellow employers terrified by insurance companies. There was a sudden sharp drop in the fraction listing insurance as teh worse problem just about November 2008. Now part of this (as with the blues) is low sales driving other problems out of first place. Still the decline is very very dramatic. There is no similar decline in complaints about taxes (is there ever ?). I think that small businessmen were naively optimistic about health care reform’s chances in congress and counted on HCR eliminating their problem buying insurance for newly hired workers so soon that it was worth hiring and paying through the nose for a year — oops in the event 6 years, but, hey, too late now employers. I’d say the graph shows fairly strong evidence that HCR caused increased hiring by small firms. Now it might have reduced hiring by large firms (which feared a mandate which turned out to be fairly feeble). 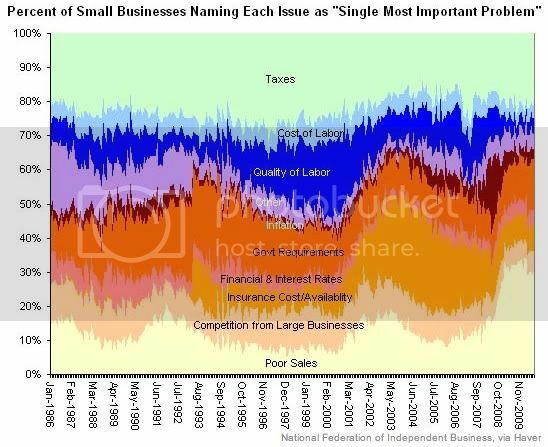 For both the issue of the blues and the yellow, I’d like to see a graph of the fraction of small businesses naming something an important problem not just the most important problem. That way the numbers would not have to add up to 100% and one could really tell to what extent concerns about insurance, the quality of labor and the cost of labor declined and to what extent they were driven out of first place by collapsing sales. The point of the first chart, I believe, is that as our navel power decreases Chinese navel power increases. But that aspect needs to be described carefully as the chart does not explain the differences in navies between the two countries. The point of the second chart is to demonstrate the conundrum of manpower expenses and the rising costs of technology that outstrip resources…ie getting fewer units for a lot more cost. That you are not speaking German = FDR, U.S. military forces, and the U.S. defense industry. The fourth aspect is the losing strategy of our lack of cohesive trade policy in some form of national self-interest, which I believe is at odds with the current views of free trade enthusiasts for little federal intervention and reliance on the good graces of multi-national companies and equilibrium theory of some economists. But that is for another post.